We have been in business in the Orlando, FL area since 1985, so we have a lot of experience with condenser unit sales & repair. A condenser is an important part of any heating or cooling mechanism. It condenses a gas into a liquid state, which is generally done by cooling it down, so it can move through the machine. Many appliances that people use every day use condensers, including air conditioners, furnaces, refrigerators, and more. If you start to notice a problem with any of these appliances, you may have a condenser problem. If a condenser line in an air conditioner is not properly insulated, it can also cause problems due to dripping water, which can result in weakened drywall and/or growth of mold and bacteria. 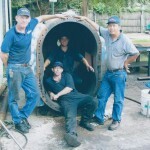 At Pat’s Pump & Blower, we offer condenser unit sales & repair for all of your needs. We offer services to residential customers who simply need a repair on their existing condenser unit, or we also provide service to commercial and industrial clients who are doing repairs themselves and need to buy products and tools to install condensers. We have been in business in the Orlando, Florida area since 1985, so we have a lot of experience with condenser unit sales & repair. We are well known in the industry for our commitment to excellent service and quality work. Even if you aren’t sure if your condenser is the reason for a problem, give our team a call. We can provide on-site inspections and determine the cause of the issue. Our staff can then offer you condenser unit sales & repair options that will fit within your budget.